On February 10th 2016 the representative of the Emilia-Romagna Region hosted a public assembly, organized by the Italian social cooperative Lai-momo and the online platform Asylum Corner, which saw a panel of experts discuss the challenges of reception and inclusion of asylum seekers throughout Europe. As the title implies “Welcoming is not simple. The challenge of inclusion of asylum seekers in Europe and at the local level”, the aim of the meeting was to problematize and debate the phenomenon of reception of asylum seekers with panellists working in different sectors of the asylum field, therefore making the panel reflect the mission of Asylum Corner itself. Lorenza Badiello, director of the Brussels Office of the Emilia-Romagna Region, gave the opening speech, addressing the issue of migration as a key topic today for most local authorities in Europe. Following on from that, the audience had the chance to enjoy contributions from Michele Cercone, head of the Communication sector of DG Home – European Commission, Nicolas Jacobs, Legal service deputy director of Fedasil, Torsten Moritz, Executive secretary of the Churches’ commission for migrants in Europe, and Andrea Marchesini Reggiani, President of the social cooperative Lai-momo. Michele Cercone provided the audience with a broad overview of the European migration crisis, focusing on the latest measures implemented by the European Commission to fill the gap of information and communication with asylum seekers in their countries of origins and along their journey to reach Europe. Thanks to the use of conventional and modern social media, the European Commission is working to rule out the criminal networks which smuggle migrants inside the EU, aiming to replace them with safe and useful information tools for the asylum seekers who want to reach Europe. Focusing more on the Belgian State, Nicolas Jacobs of Fedasil (the Belgian agency for asylum) offered a summary of the way the great migration wave of 2015 impacted on the Belgian reception system. In 2015, 36,000 asylum seekers – more than double compared to the previous years – applied for asylum in Belgium, ranking Belgium as the sixth country in Europe for number of asylum seekers hosted. The Churches’ commission for migrants in Europe, represented by Torsten Moritz, raised its voice as a civil society organization, criticizing the inadequateness of most national asylum systems and, in general, of the European common migration policies. 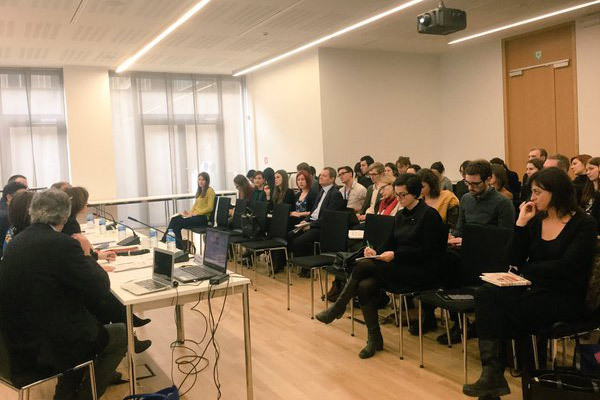 From the great disparities in asylum recognition rates, to the blindness of the EU institutions in the face of the need to create legal channels to reach Europe, Moritz raised important key issues which the EU will have to address in the near future. Finally, Andrea Marchesini Reggiani from Lai-momo social cooperative provided a detailed description of the reception system in the Italian Province of Bologna, where Lai-momo runs several reception centres in partnership with other private and public institutions. Marchesini stressed the importance of providing not only primary goods and services but also integration projects which can spur the inclusion of migrants in the local social fabric. At the end of the panel talks, Claudia Marà from Lai-momo social cooperative presented Asylum Corner, the new online platform which Lai-momo has created with the purpose of gathering togetherthe voices of the many stakeholders working in the field of asylum in Europe in a single online tool. A fruitful debate with the public closed the panel session which was followed by rich refreshments with Emilia-Romagna delicacies.